This is another useful presentation from Sami Ullah, the renowned civil engineer, for civil engineering students. 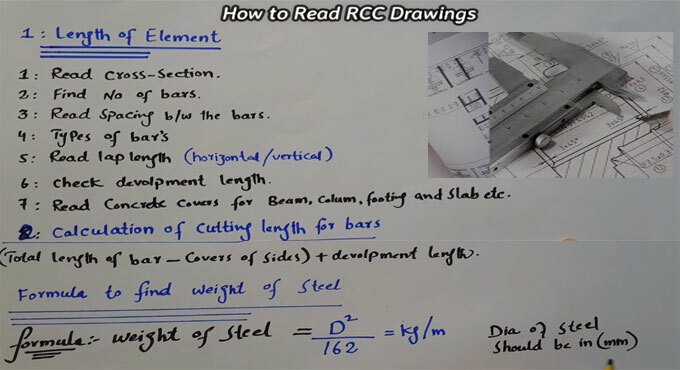 In this video, Mr. Sami briefly explains the process for studying the RCC drawings of RCC works as well as learn the formula to determine the weight of steel that is vital for steel calculation. Study cross-section – It is necessary to determine the amount of steel of RCC work for slab, beam and column. Find no of bars – It is vital to determine no of main bars, distribution bars etc. in RCC drawing. Study spacing among the bars in center to center – Spacing among main bars, distribution bars should remain at 3 inches, 6 inches and 7 inches. Types of bars – Study various types of bars in beam, slab, column etc. There are different shapes of bars like crank bars, bent up bars etc. Study lap length – Lap length should be studied for compression member and tension member like beam and column. A lap is required when two pieces of reinforcing bar (rebar) are overlapped to produce an incessant line of rebar. Lap length varies with respect to tension and compression zones and solely based on concrete strength, the rebar grade, size, and spacing. Study development length - The development length is defined as the length of the bar necessary for transmitting the stress into the concrete. So, the development length should be studies carefully. Study concrete covers – It is required for beam, column, footing, slab etc. Concrete cover, in reinforced concrete, stands for the minimum distance among the surface of implanted reinforcement. 2. Work out the cutting length of bars – It is done with the following formula. D2 /162 = Kg/m, here D stands for dia of steel. The measuring unit for finding out dia of steel should be in mm. Watch the following video to get more clear ideas.